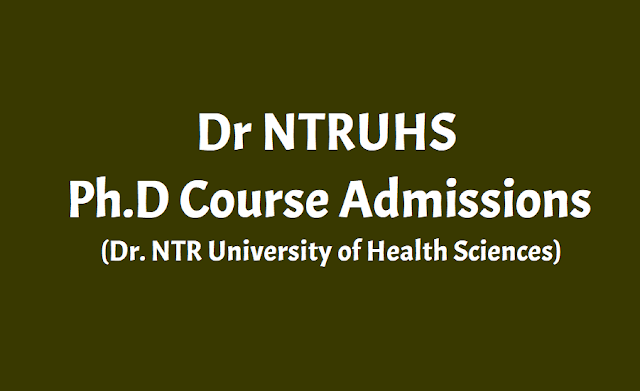 Dr NTR University of Health Sciences Andhra Pradesh, has given Notification for Admission into Ph.D., course for the academic year 2019-2019 on 28-12-2017 and Applications are invited from eligible candidates with requisite qualifications in the field of Medical Sciences or allied subjects for Ph.D. programme of Dr. NTR University of Health Sciences, Vijayawada for the academic year 2019-2019. Applications are invited from eligible candidates with requisite qualifications as per Ph.D. Regulations 2018-2019 in the field of Modern Medicine (pre-clinical, para – clinical and clinical subjects), Dental Sciences, AYUSH (Ayurveda, Yoga, Unani, Siddha and Homeopathy) courses, Physiotherapy, Nursing, Naturopathy and other Allied Health Sciences for Ph.D. programme of Dr. NTR University of Health Sciences, Vijayawada for the year 2018-2019. Application form, Regulations for Ph.D. programme, List of Recognized centre and List of Recognized Guides are available in the University Website (http://ntruhs.ap.nic.in), which can be downloaded from 04.12.2018. The filled in application form along with copies requisite certificates and a non-refundable fee of Rs.5,000/-(Rupees Five thousand only) by way of Demand Draft drawn on or after 04.12.2018, in favour of “The Registrar, Dr. NTR University of Health Sciences payable at Vijayawada” should reach the Convener, Ph.D. Admissions – 2017-18, Dr. NTR University of Health Sciences, Vijayawada on or before 10.01.2019. The list of documents to be attached are mentioned in the application form. 8. For project approved by the committee and requiring Clinical Trial Registry of India (CTRI) approvals will not be permitted to proceed with the Research unless the CTRI approval is furnished by the candidate.